An Indiana State University nursing professor has been recognized by the Indiana State Nursing Association for her efforts in helping to develop health-related public policy. Veda Gregory, an associate professor in the ISU baccalaureate nursing program, has been honored with the Georgia B. Nyland Public Policy award for her more than 30 years of contributions at the state and local levels. In the early 1980s, Gregory developed a statement that became part of Indiana State Nursing Association's position on HIV testing. Her work helped to halt legislation that would have required Hoosier hospital patients to undergo mandatory HIV testing. In addition, Gregory has for more than 30 years facilitated meetings of the Indiana State Nursing Association Wabash Valley Chapter drawing in state and local legislators. During the 2008 U.S. Presidential election season, Gregory influenced candidate Hillary Clinton's health policy team to discuss with the Terre Haute community the candidate's position on health care reform. Gregory also teaches students to advocate for high quality health outcomes among the populations with which they work. Ernest C. Klein, Jr., executive director of the Indiana State Nursing Association, said Gregory's receipt of the biennial award speaks highly of her efforts. "She's been a firm advocate for nurses and healthcare and has shared that advocacy with her local legislators," Klein said. "When I'm at the [Indiana] state house, I'm always asked how Veda is doing." The Indiana State Nurses Association is the professional organization for Indiana's registered nurses. The Association was organized in 1903 to secure a nurse practice act to protect the citizens of Indiana. 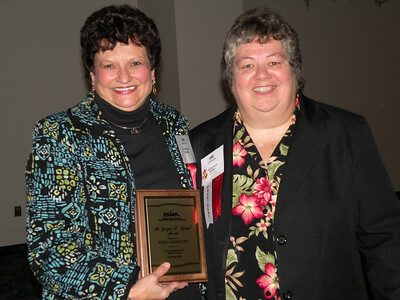 Cutline: Veda Gregory, left, is pictured with the Indiana State Nursing Association President Ella Harmeyer after being awarded the organization's Georgia B. Nyland Public Policy award.